A handy jar in a convenient size. Perfect for a small batch of wine. 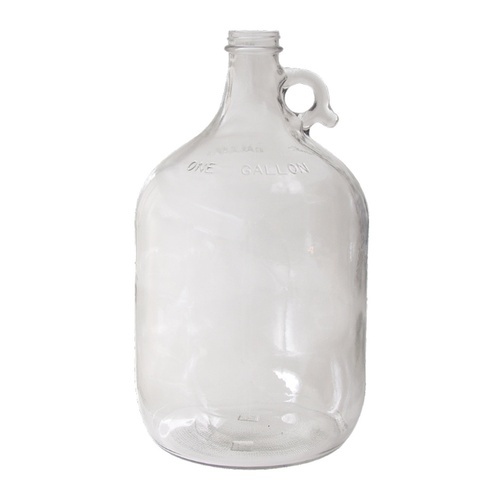 Our 1 gallon glass jar works great for holding small amounts of wine or mead for aging, small batch fermentation, overflow storage and fermentation experiments. Use to store excess wine when you press off and have more than you expected. Ferment small batches of mead, sake, fruit wine or anything else that strikes your fancy! Auto Siphon Starter Mini - 5/16 in. This is good for my small batches. Use for chilling sterile top off water in the frig. Just what we're been wanting for years to hold our drinking water. Heavy duty. Great quality. Good packaging and delivery. Thx much! Good glass jugs. What more can I say? Splitting a batch up between a few of these one gallon jars makes trying different things fun and you don't ruin an entire batch that way. Oak, flavorings, hops, fruit anything you can think of. I don't use for small batches, but some of those big beers (like the imperial saison i brewed a few weeks ago) will benefit from up to a 3L starter. When working on a new recipe, I often use 5 of these 1-gallon jugs as secondary fermentors to try out various dry hop combos and flavorings. Why wait for a whole brew cycle to make one adjustment to a new recipe when you can make 5 adjustments, pick the best result, and move on from there! These are also great to have around for the occasional small batch of mead or wine or whatever. I am very happy with the jar and it is the cheapest I have found. Great for testing out yeasts or different dry hop experiments.